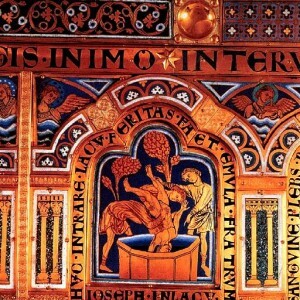 Detail of the Verduner altarpiece in Klosterneuburg, Austria by Nicholas of Verdun. Joseph thrown in the pit. It’s funny how when I look back over my life, it’s the most painful, difficult episodes that have led to the greatest moments. At the time, of course, going through difficult patches is deeply unpleasant, but I’ve seen for myself that more often than not God works through these hardships to mould us into the kind of people that he would have us be. When I was made redundant from my job in retail management at the age of nineteen, it felt like my life and career was over. Yet this sudden departure from my intended career allowed me to spend three very happy years at university, followed by another happy year at a different university. When I found myself suffering from acute anxiety and depression it seemed like there was no future for me. Yet having these experiences has shaped me into a kinder, more tolerant, more compassionate human being, a better follower of Christ, and indirectly led to marriage and a wonderful son. I suspect that Joseph had similar thoughts during his life. At the time described in today’s verses, being thrown into a cistern and left for dead, and then being sold into slavery must have seemed to be the worst possible situation to be in. He found himself alone, far from home, far from the father who cared desperately for him, facing a bleak and uncertain future ahead of him. Of course, his brothers (with the possible exception of Reuben in today’s verses, and possibly Judah later in this chapter) intended to harm Joseph, indeed to kill him. They had had enough of him. They were sick and tired of Joseph getting all the adoration from their father. And they were especially sick of Joseph arrogantly recounting his dreams which suggested that he would soon rule over them; it is the dreams that they give as the reason for their action at the beginning of today’s verses. Finding Joseph in the middle of the desert and far from home his brothers decide that enough is enough, and that Joseph has to die. Most of the brothers want to kill Joseph and throw his body into a cistern. It is only because of Reuben’s compassion that Joseph lived to tell the tale. So, what can we take from today’s passage? Once again we see the dangers of anger, the consequences of being fuelled with hatred which can lead us to take rash decisions. We can see that, as Reuben did, sometimes it might be necessary to speak out, to be the sane voice in a group of hot headed people who are not thinking straight. But perhaps most importantly of all, if we know the conclusion of the story of Joseph, we can see that when we find ourselves in the pit of despair (literally in Joseph’s case), it does not mean that we have been abandoned by God; God is still with us and can still work through us to achieve his plans. Indeed, it might be that when we find ourselves at the darkest moments of our lives that God is working most actively in our lives, whether we are aware of it or not. This entry was posted in Audio, Bible Reflections, Daily Reflection, Podcast and tagged Genesis. Bookmark the permalink.